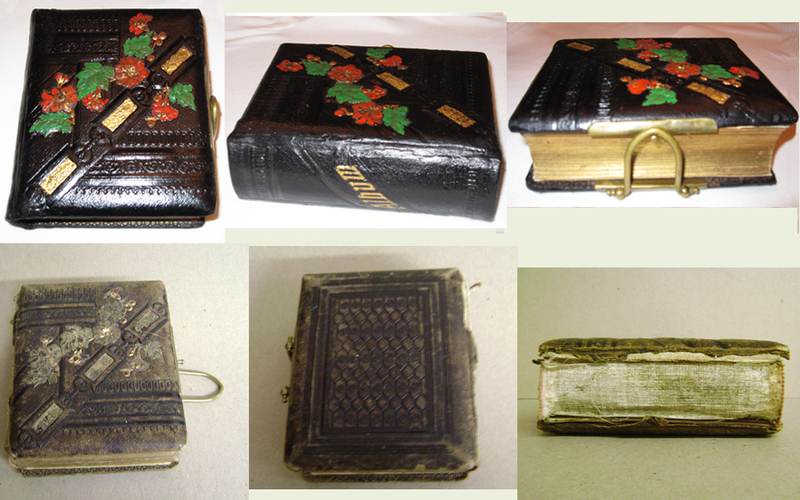 Examples of Family Bible and other book restoration and fine binding may be found in our gallery. 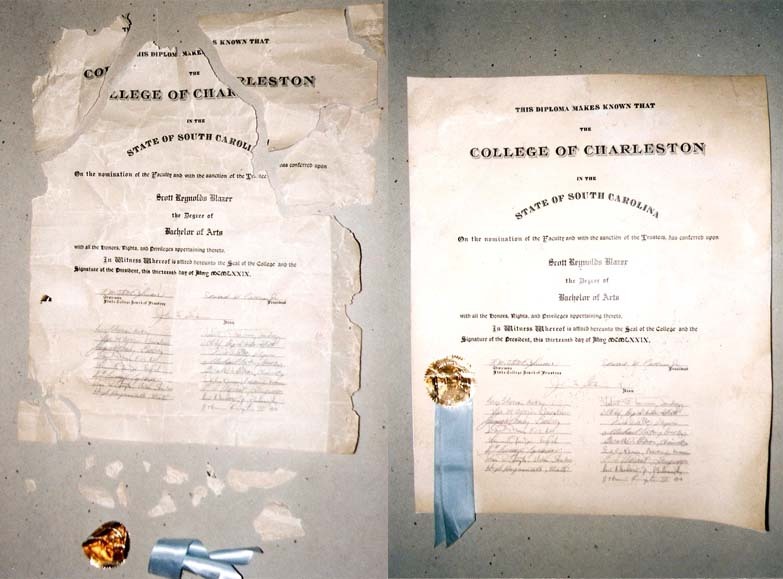 Sometimes "man's best friend" is his worst enemy, as in the case of this chewed up diploma. The dog must have liked the taste of the paper some. He apparently swallowed pieces. When we restored this document we mounted it on linen reinforcing cloth and framed it. This little volume was rescued from the "Pierce House Fire" 1981 at Longwood Gardens, Kennett Square, PA. It was part of the personal library of Pierre S. Dupont, II, Longwood's founder and creator. There was not enough of the original binding left to merit restoring the leather binding. The text however, exibited fire, smoke, and water damage. Note the "tide marks" in the "before" view of the text-block. Treatment on this book called for disassemblimg the text-block, then washing and bleaching, followed by deacidifying and resizing of the pages. The pages were put in proper sequence and re-sewn onto raised linen cords. Silk head and tail bands were hand-woven onto the text-block. The original boards were flattened and reused and covered with calfskin which was marbled employing the ancient method of using various chemical salts sprinkled onto wet leather to form various shades and patterns. Our customer opted for a replica binding on this book. We still used the original boards after the old leather was removed. The sewing structure was broken and in need of resewing. After resewing onto raised cords, a new, vegetable tanned calf binding was made. The leather was the sprinkled and chemically stained to simulate the appearance of the original, The spine was then hand tooled according to the original design. Because the old end papers were missing, new ones were stained to have the appearance of age. Family Bible was found in the attic of our customer's aunt. It was under the eaves where there was a roof leak. At first, our customer thought it was a block of wood supporting the rafter. A closer look told him that it was a book. On examination he discovered many familiar names in the record section and knew this book must be saved. The embossed boards were delaminated and deformed, which necessitated re-wetting and reforming. The leather was shrunken and extremely brittle. The old leather was chemically treated to produce flexibility. 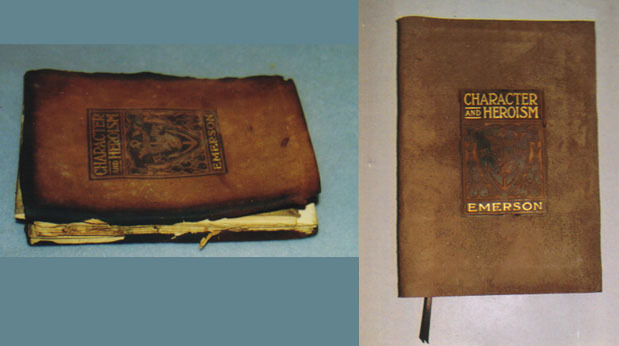 After the text-block was resewn and backed, it was recovered with new leather used where leather was missing. The original leather was then reapplied. Everything seen in the before view has been used in the restoration, as seen in the after view. Unfortunately, we have no before shot of this set. Quarto: half leather with corners. Beveled boards with vegetable tanned calf. Genuine gold tooling. The boards and cloth are original to this set. The gilt work is a replica of the original. To give the new leather an older appearance it was somewhat distressed. "Complete Arithmatic" was a textbook used by the owner's grandfather. Therefore, it was important that as much of its original appearance was maintained. The leather spine was missing and only the portion that extends onto the front and back cover remained. The boards were covered with paper which had worn through in various places and was worn away completely at the corners. 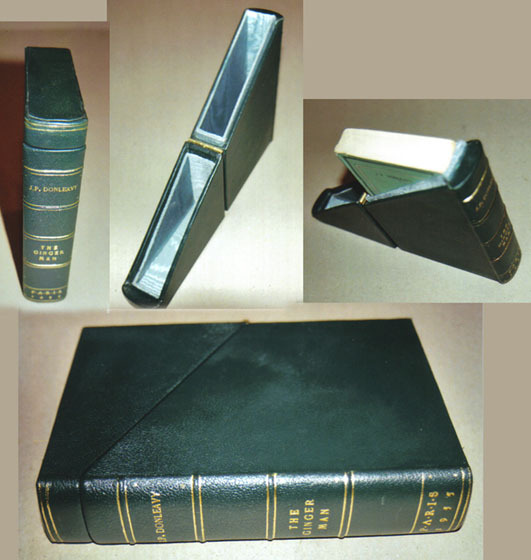 A new leather spine was made and attached to new cover boards that was then covered with paper tinted to match the original paper, The old paper was lifted from the old boards and reapplied onto the new. The binding of this custom made journal was made by cutting strips of natural finish, vegetable tanned cowhide and weaving them into a basket pattern. The linings on the inner covers is French marble paper. The word "JOURNAL" is blind stamped on the spine. The text-block is 100 lb. Manadnock Dulcet paper, sewn onto tapes. Thus, allowing the book to open relatively flat to accomodate the writer. The edges of the text-block are stained a mahogany color and burnished to a high gloss. This journal was commissioned by a lady in England as a present for her husband who keeps a journal and also draws in it. He is very fond of things medieval. The book is 11.5 inches by 16.5 inches. It was hand sewn with linen thread onto heavy cords, laced into wooden boards. It has hand woven colored linen headbands and silk end-papers. The hammered brass work (corners and escutcheons) were artificially aged. 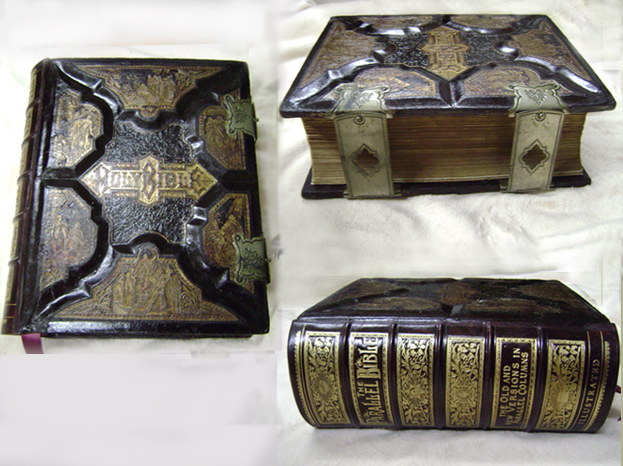 The English calf binding was also made to look as though it was in use since the 16th century. This Bible was printed in 1807. The original binding was not salvageable. The sewing in the text-block was broken in several places, necessitating re-sewing. The Bible was resewn onto heavyweight cords, as it was originally and the original boards (old leather removed) were laced on. This type of sewing is extremely durable and unfortunately almost never done these days. A new diced calfskin binding was made onto the book and was hand tooled with 23K genuine gold. 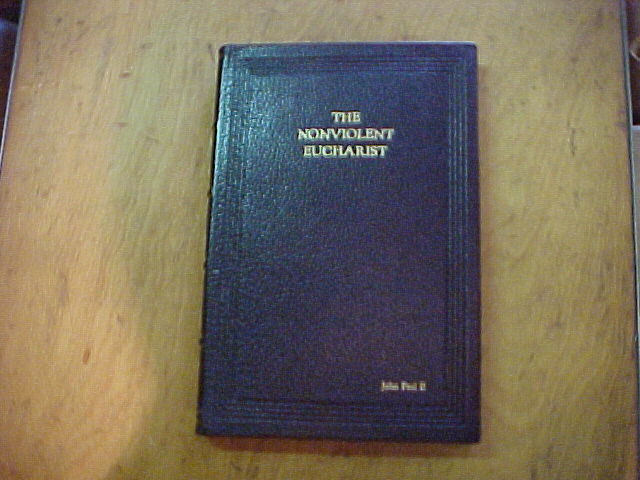 Today, this Bible is on display at the Kennett Square, PA Quaker Meeting House. Only seven of these books were produced in this form and dedicated to the Pope by the author Rev. Charles McCarthy of Boston. They were bound in Nigerian goatskin and tooled in gold and blind (impression only). The volume that you see pictured was presented to Pope John Paul II at The Vatican by Bishop John Michael Botean of Canton, OH. 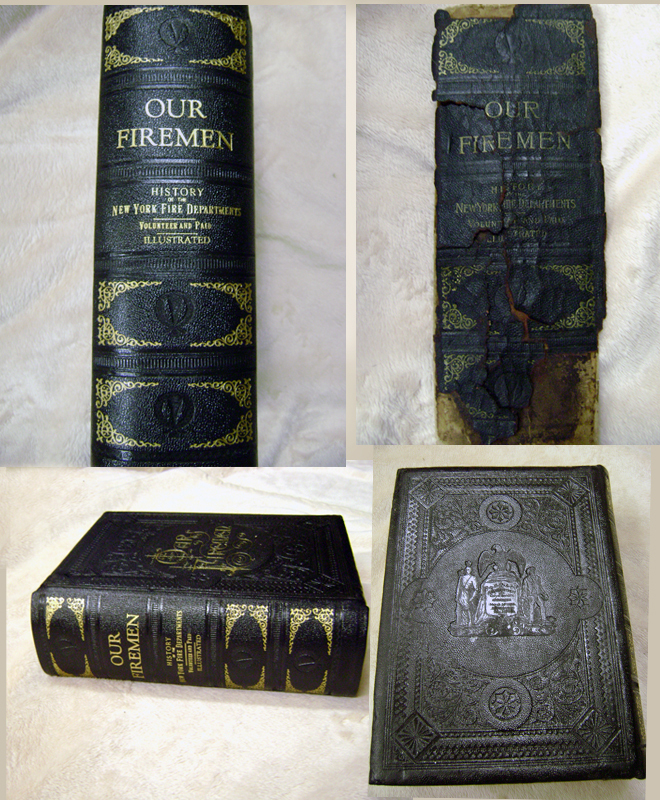 Salvaged from a flood; this little volume was partially restored. Most of the original "non-turned" calf binding was made too brittle for use by the flood water. The portion that bore the title and decoration was saved and reused as an overlay on a new non-turned calf cover. The binding on this book was in very good condition. Its owner wanted to protect it from wear and environmental enemies. We constructed a protective box that had the appearance of the original book so that even though the book would not be readily seen, its look was represented by the box. This first edition (1955) paperback needed protection and its rarity demanded a fine leather box to house it. The box was, of course constructed of acid free binder's board and covered with vegetable tanned Nigerian goatskin then decorated with 23K gold. The inner case is lined with silk moire. 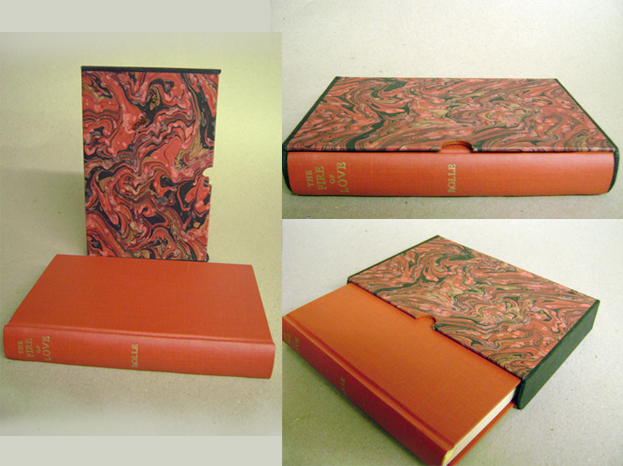 Bound in scarlet Nigerian goatskin with genuine gold hand tooling, and French mabled end papers. The text-block has red burnished red edges. 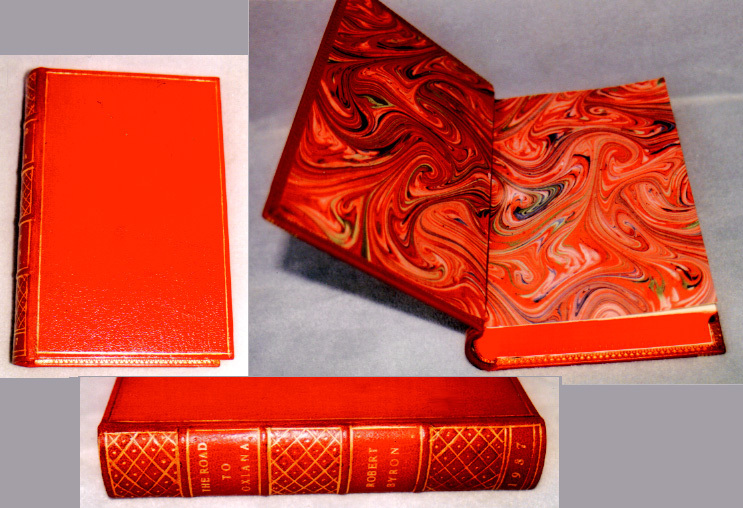 Lewis Carroll's "Hunting of the Snark"
This rare edition was given a calfskin box, worthy of its value. The box is constructed of acid free binder's board and wood, covered with English calfskin. The edges are hand gilded with 23K gold. The padded inner case is rayon acetate and French marble paper. The "Hunting of the Snark" book was also restored, but, no "before) pictures were taken. 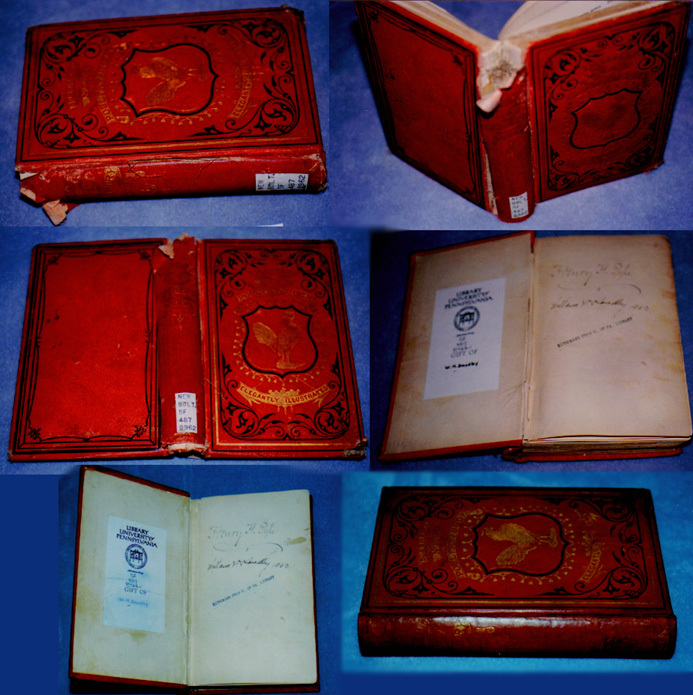 This book was restored for the University of Pennsylvania Library. All existing materials, with the exception of the library reference numbers label on the spine, were used in the restoration. The end papers with important signatures and the bookplate were washed, deacidified, and reused. The treatment on this book was a replica binding. The original boards were reused and a new calf binding was made to look the same as the original. This book, printed in 1695, was in such poor condition that the original binding could not be saved. The pages were rusty brown and tattered. They needed to be washed and mended. The text-block was sewn onto raised bands and the sprinkled English calf binding was made using the same materials, design and techniques used in 1695. 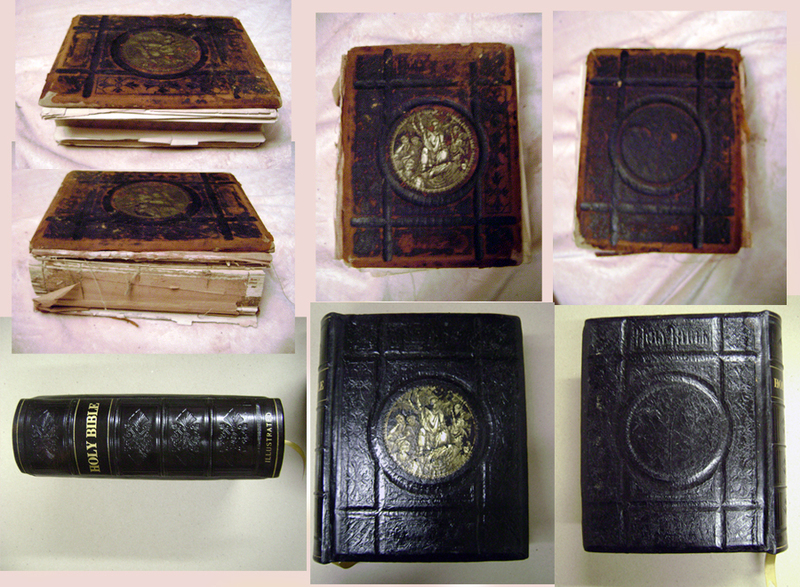 These 16x11 inch volumes pictured are two of five. 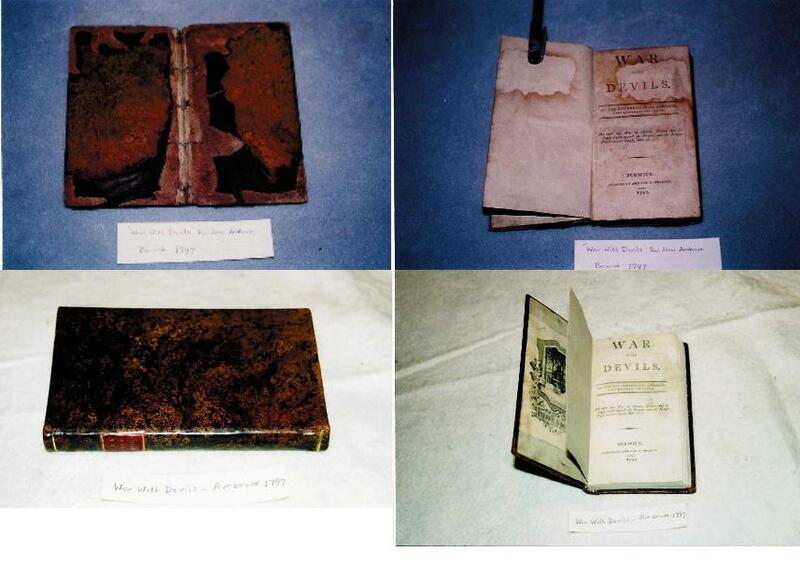 Our customer had five unmatching volumes, all in disrepair. The volumes were in need of resewing and a great deal of page mending. We only took picture of the last two volumes shown here. 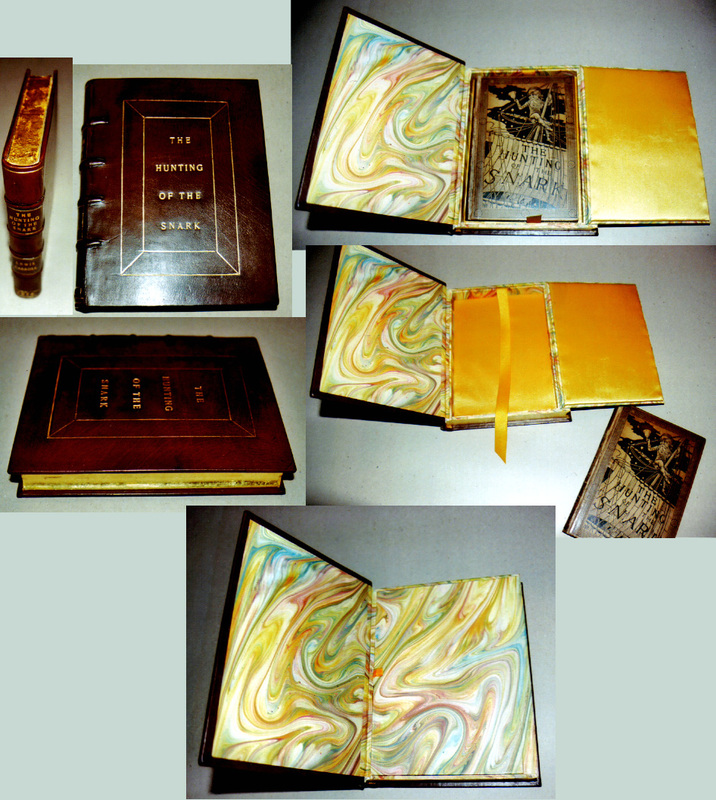 They are bound in English calfskin with hand marbled paper on the boards and tooled in genuine gold and blind. This binding is an exact replica of the original. The slip case was, of course, made to fit the book. 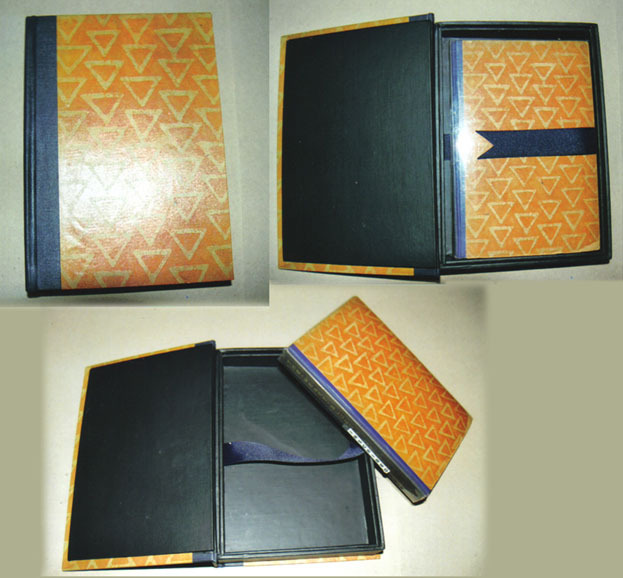 This slip case is made of tough, solid binders board; unlike commercial slip cases which are made of acidic chipboard. This particular slipcase is covered with French marble paper and bookcloth. Yours may be covered with the material of your choice. 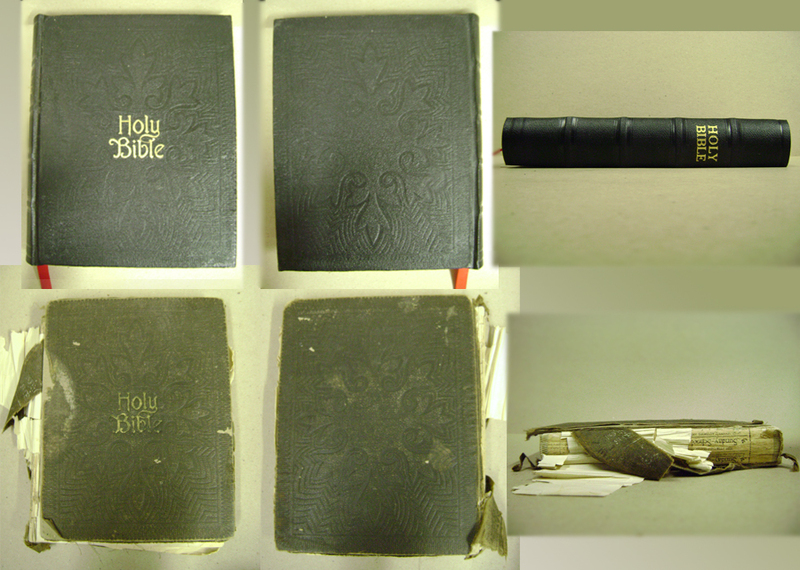 This Family Bible, circa 1887, needed to be resewn and many pages were in need of mending. The spine was missing and there was a great deal of wear to other parts of the leather cover. The pages were mended with Japanese mulberry paper and the text-block was resewn onto linen cords. We created a new spine that is an exact replica of the original. We were able to do this because of the great many tools and engravings that we have accumulated over our fifty-eight years of bookbinding. 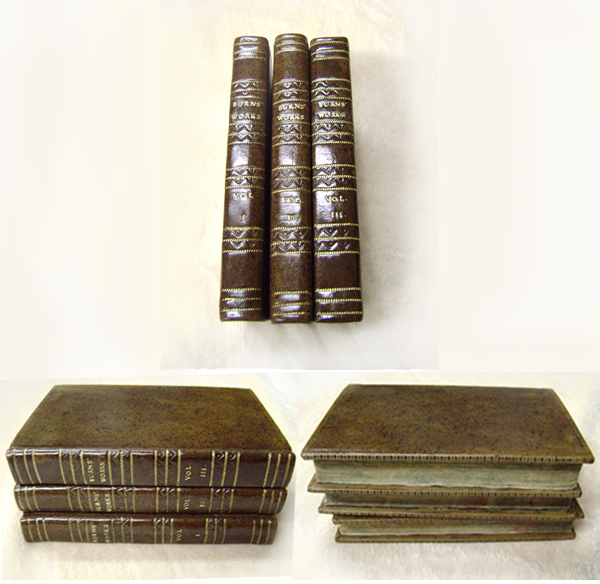 These three volumes are exact replicas of the original sprinkled calf bindings which were too acid decayed to restore. However, we did use the cover boards and the original endpapers. 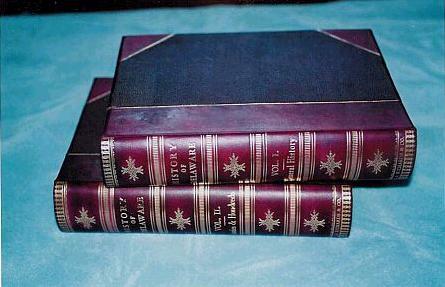 Engravings were made to duplicate the design from the spine. This journal is approximately 15" x 11" Bound in black Nigerian goatskin with 24K Gold tooling. The text-block was hand sewn and the cover boards were laced on. The locking buckled straps are fastened on with brass nails. The pages are parchment paper (vegetable parchment)with stained edges and a ribbon marker. This Family Bible was in rather sad shape there were a good number of pages to mend and the text-block was in need of sewing. The leather binding was acid decayed and exceedingly scaled. The spine was missing and the gilding on the front was very dirty. The old leather was chemically treated to halt the decay, the gilding was cleaned and the old leather was re-tinted to bring it back to its original shade. We created a new spine that was in keeping with the blind tooling on the front and back boards and also to be period correct. The original end papers were lifted and put back into place when the rest of the work was finished. 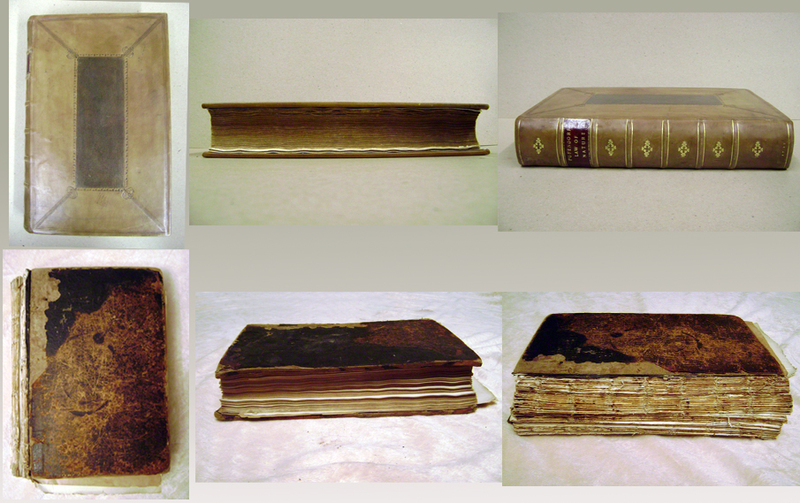 This late 19th Century leather photo album was in fairly poor shape the cover boards were detached, the spine was detached and most of it missing. The interior pages had cut-out receptacles for photographs and a good number of those were broken. 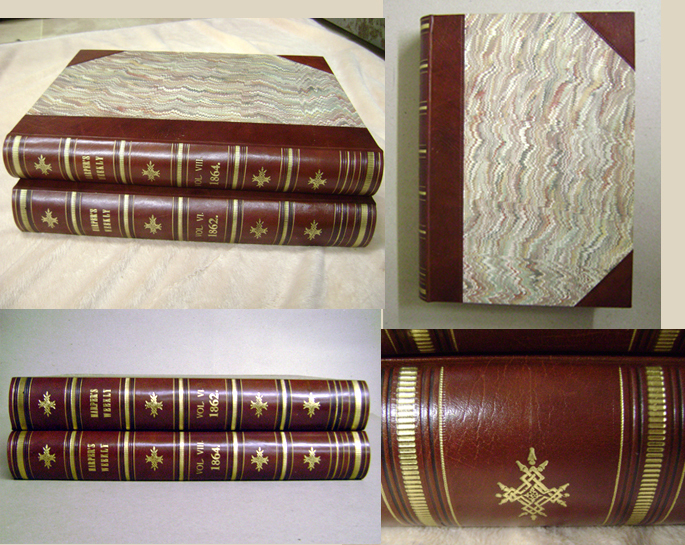 We mended the pages, and restored the original leather binding, including recreating the missing portion of the spine. The colored potions of the front cover were retouched. Quarto, half calf with corners. The English calf was scored to resemble the original leather. The text-block having been made with single leaves was over-sewn onto raised cords. The spine is "tight" (glued directly to the text-block) and hand tooled in gold. The title labels are Nigerian goatskin. The boards are covered in hand made marbled paper with blind tooling where the leather meets the paper. This NIV study Bible was originally bound in hardback.We rebound it in domestic embossed cowhide; our least expensive leather. It was given false bands and was tooled with genuine gold. The limp binding is of a non-turned edge style. A nice book but unusable, was the condition of this early 20th Century copy of Lewis Carroll's children's fantasy. Originally it was held together with wire stitches (staples) which were rusting and discoloring the pages and because the paper was rather stiff the pages would hardly open. The book had gotten wet at some period and much of the binding was water stained, missing, and mildew damaged. We The mended the pages with Japanese mulberry tissue with missing areas filled in with paper of a similar weight and color. We resewed the text-block onto cotton twill tapes. The Cover was reconstructed using the original boards and paper (cover illustration was retouched as needed)New paper was used under the original to add strength and a solid appearance. New linen cloth with color matching the original was used on the new spine. Even the picture end papers were restored and reapplied. 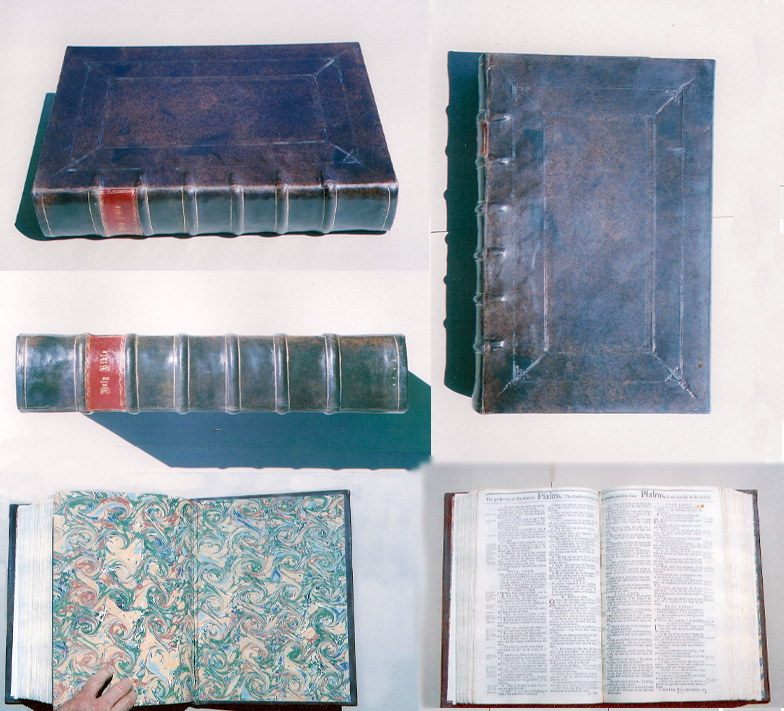 This large Family Bible was missing its spine and all the leather from the original. The only thing left of the original binding was the back cover board. Even the padding was gone from the once padded cover. We made another cover board like the original for the front and then a new cowhide binding was made that was in keeping for Bibles of this era. A much loved family cook book. This White House Cook Book was missing its cover as well as a good number of pages in both the front and back. The pages yellow and somewhat brittle. From our stock of old book parts we were able to replace the cover and the missing pages with parts from an identical copy. The paper from our copy was in better condition and much more white. To keep the pages of an even appearance, we tinted the "new" ones to an exact match of the original. The "new" cover was restored and put on our customer's copy. 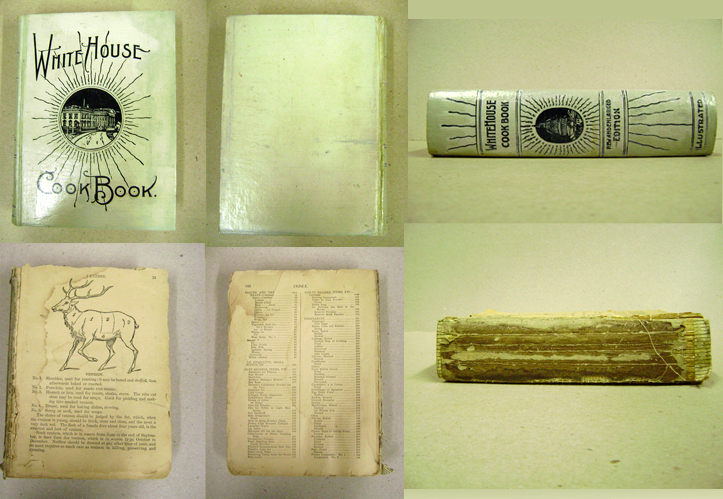 While some of the book was not "original" the final result was now a complete 1913 White House Cook Book. Nearly gone. This Mid-Eighteenth Century King James Bible was in very poor condition. The text-block was broken and the pages were coming out. They were torn, tattered and nearly so brown form handling and from the acidic nature of the ink that they were barely legible. The spine was nearly none existent and the cover boards were worn round at the corners and the little leather remaining was brittle and "alligatored" from having been wet at some point. After taking the book completely apart, we washed, bleached, buffered, and resized the pages. We did not make the ghostly white. We just wanted them to look good, not new. The tattered leaves were mended and the text-block was sewn together again as it had been originally on raised cords. New linen headbands were woven onto the head and tail caps. The original boards were rebuilt and a new calf binding was made and decorated in the Cambridge style that was popular when this Bible was printed. We reclaimed and used the endpapers that were on the Bible when we received it. It is not certain if they were the original end papers or not, but they were of enough age that we felt safe in using them. With the exception of some "tide marks" from being wet, the pages of this gem were in remarkable condition, having very little staining otherwise. The rest of the folio size volume was not in so good a condition. The text-block was broken in several places. The thread had obviously rotted from being wet. The leather binding was shrunken, blackened and, brittle. We washed the first and last few leaves to remove the worst of the "tide marks." The text-block was resewn onto heavy linen cords. Linen headbands were woven on. The original boards were unusable, so we laced on "new" ones of equal age. A new English calfskin binding was drawn on and given Cambridge style decoration. All work was done by hand including gold and blind hand tooling. As you can see, this Bible was in need of a lot of work. The pages we torn and tattered, the text-block was broken. The boards were detached, and worn away at the corners. The cloth was torn, tattered, and faded. The lettering was coming off. We mended the pages with Japanese mulberry paper. The text-block was resewn and rebacked. A ribbon marker was added. We rebuilt the corners and created a new binding incorporating the old cloth with the new. The original cloth was retinted to its original color. The title was retouched.